Herts constabulary report the multi-agency training event has been hailed a success. The scenario was based on a marauding terrorist threat within the ground and the tactical response of police and partners. Dozens of volunteers braved cool temperatures and rainy conditions to act as ‘casualties’ and give the exercise an authentic feel. 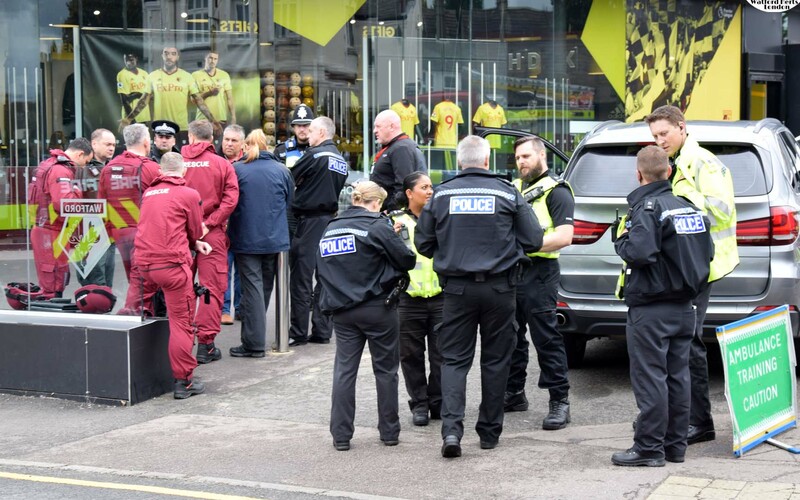 Herts Emergency Service Crews outside the Hornets shop in Vicarage road. 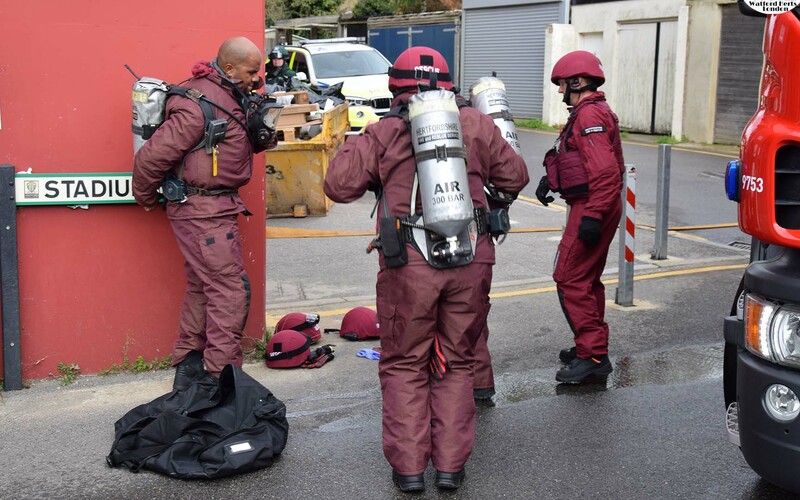 The training session involved the East of England Ambulance Service, Hertfordshire Constabulary, Hertfordshire Fire and Rescue Service the local NHS Trust and Watford General Hospital, Regional Military Liaison and a range of stakeholders including Watford Football Club and the Premier League. It started with a traffic incident outside the stadium before becoming a mass casualty exercise within the grounds. The Three hour exercise started at around 11am and came to a finish around 2pm. Chief Superintendent Richard Liversidge was the Force lead on the exercise and wanted to extend his thanks to all those involved. 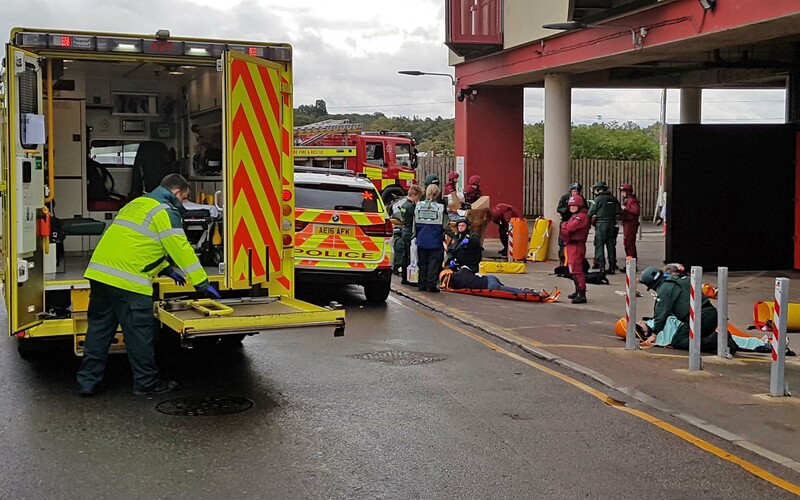 He said: “This timely and highly relevant exercise was designed to test our multi-agency response to an on-going incident involving mass casualties. This is a complex task and such responses require the commitment of all agencies and many other responders and organisations. Whilst a level of disruption was anticipated, no concerns were raised to police related to the event. 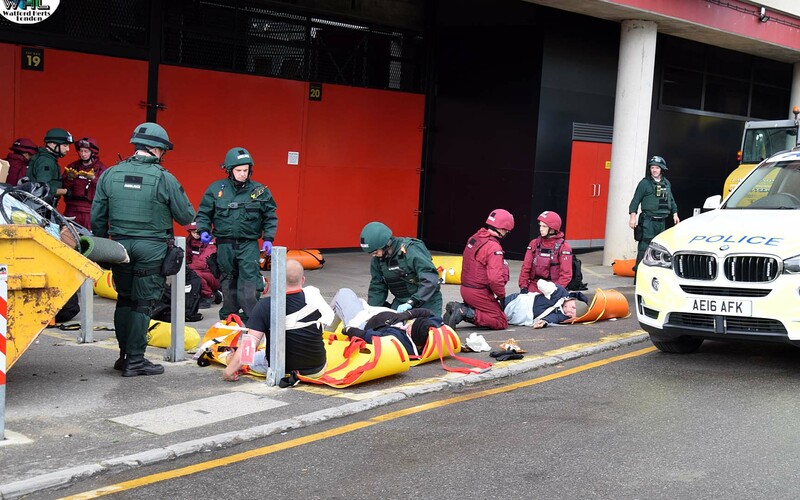 Glyn Evans, Watford FC’s Operations Director said: “It was our privilege to host an exercise that demonstrated good communication and highly collaborative working to be at the forefront of everyone’s thinking. Participants will get to share their experiences of the exercise during a dedicated de-brief.